Polished stone, embossing & brayering. 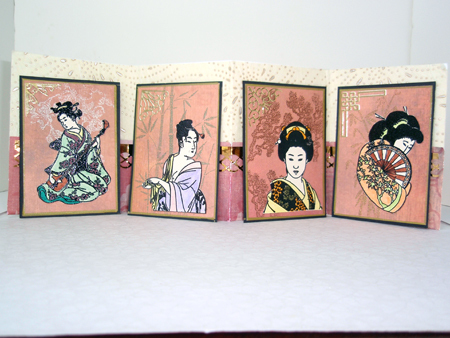 Your favorite embellishment to finish a card? My computer for inspiration. My paper cutter. Make sure you do challenges & swaps, don’t shy away from them. 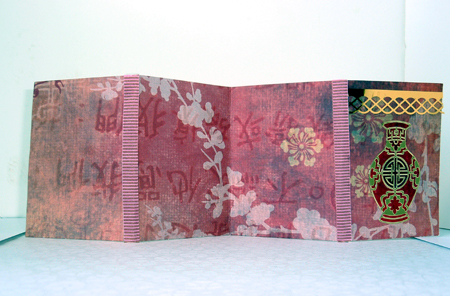 Love the colors that are used and also really like using washi paper for creating. 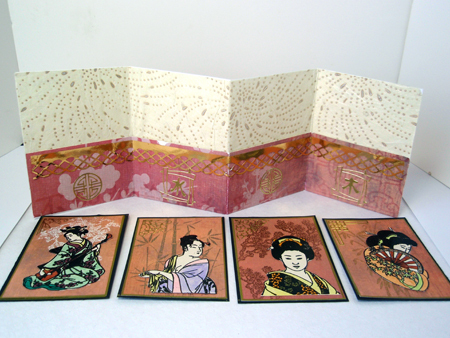 Is there any one place or city you’d like to visit to find rubber stamps, supplies, or Asian art elements? San Francisco to go to China Town and other areas for crafting. What other stamping lists or local clubs do you belong to? Local MN group. Several members of this group also belong to it. What favorite Stamping magazines would you recommend? Take Ten, Cards, Stamp It, Vamp Stamp News. Where do I start………..quilting, needle point, crochet, knitting, gardening, cards/scrap booking, painting (landscapes), sewing & cooking. . Always wanting a challenge to prove to myself I can do it. 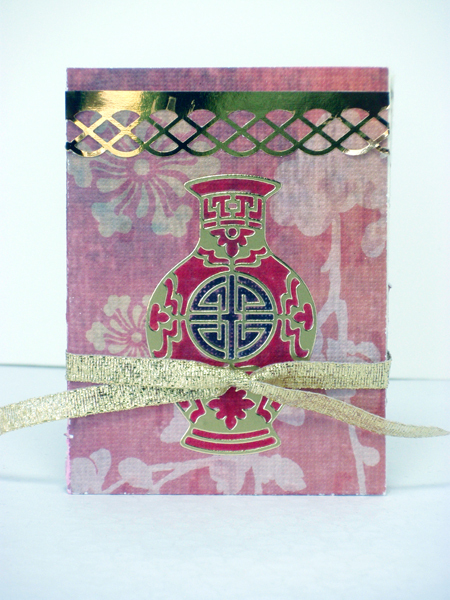 Have you used any unusual item in your stamping that wasn’t necessarily meant for stamping? Buttons, coffee filters, fabric & pop can tops. Splitcoaststampers, stamp companies to look at their galleries. You could say that…..I have cared for several family members for the last 50 years of my life, never to have had any time in between without live-in care in my home. We live in Minnesota, central part of it. We have 4 grown sons, all married and we have 6 grandchildren. We also have a cat named Missy, who rules our home. I am very involved with my grandchildren. I have taught them all to cook and craft. They also spend time with us on summer vacations. Embossing Powder, Versamark, Derwent Aqua Tone (Pencils), Water brush. Webbed punch by Martha Stewart. 6. 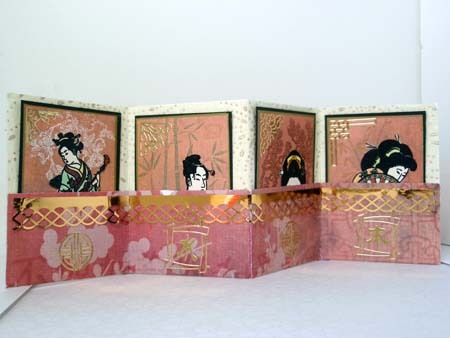 Using 1/8 inch wide, and 2 inches long pink tape, remove one side of the covering on the tape and place it along the outside edges and next to the 3 fold line on the bottom section of your card stock. Remove the other piece of tape covering and fold up on the fold to make the pockets. It’s a really great Project to do in a group …. Congratulations Dariel with bein S.A.M. of May. Congratulations, Dariel! Such a beautiful (and useful!) project. Your work is always amazing, and I’m so happy to be able to congratulate you for being Stamp Artist of the Month. Now you are famous! Enjoy! Beautifully done Dariel… and congratulations on attaining SAM for May 2010. Way to go! Nice to see a newbie here.